Omeprazole is not approved for use in infants (children aged under one year). Although omeprazole is effective at reducing gastric acidity and oesophageal acid exposure in infants, there is significant evidence that it is not effective in treating symptoms attributed to infant reflux or gastro-oesophageal reflux disease (GORD). Approximately 40% of infants (aged under one year) regurgitate at least once a day. Conservative treatment such as: winding an infant several times during feeds, holding the infant upright for a short period after feeds and using feed thickeners if bottle feeding, can improve crying and regurgitation symptoms. Breast feeding is always preferable and mothers should be encouraged to persevere with this. Referral to a paediatrician for diagnostic investigations is indicated when an infant has excessive reflux and any of the following factors are present: failure of conservative treatment, failure to thrive, suspected oesophagitis, extreme parental anxiety, diagnostic uncertainty. Figure 1 shows that in New Zealand (blue line ), prescribing of omeprazole for infant irritability and reflux is still common. In New Zealand, 120,790 children were aged under one year at some point in 2012. Of these children, 3,773 received a prescription for omeprazole (3%). A total of 14,375 items of omeprazole were dispensed to this cohort of children. The red line represents the percentage of infants in your practice who were dispensed omeprazole during 2008–2012. Figure 1*. 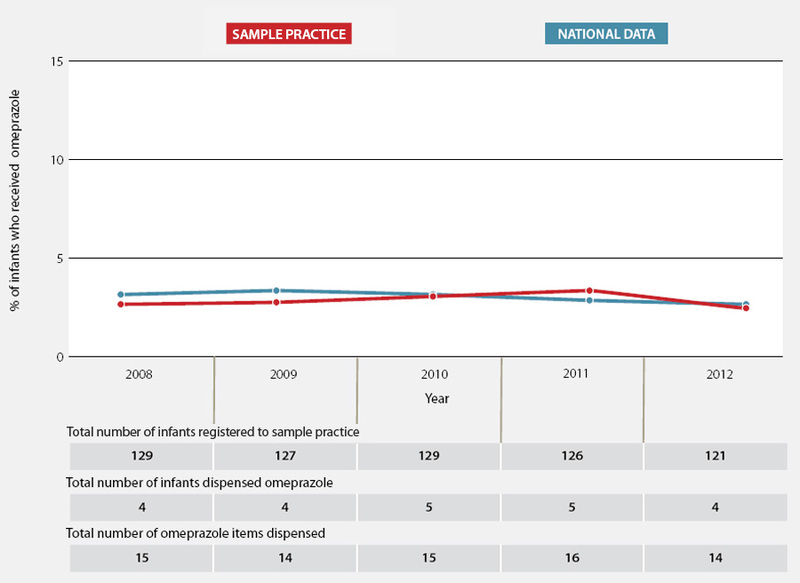 Percentage of infants who received a prescription for omeprazole from 2008-2012 in sample practice ( ) and nationally ( ). The table shows the total number of children registered at your practice who were aged < 1 year at some point during the year and the total number of omeprazole items dispensed (including repeat items) for these children during 2008-2012. In 2011 bpacnz published an article on omeprazole prescribing in children. Since then there has been a statistically significant decrease in prescribing from 16,334 items in 2011 to 14,374 in 2012. Whilst this decrease is encouraging there is still scope for improvement as the current levels of dispensings and the percentage of children treated with omeprazole is still higher than it was in 2008. Michelsson K, Rinne A, Paajanen S. Crying, feeding and sleeping patterns in 1 to 12-month-old infants. Child: Care health and development 1990;16:99-111. New Zealand Formulary for Children. 2013 [updated 2013 Nov 1] Available from: www.nzformulary.org (Accessed Nov, 2013). * Data for your practice includes prescribing by any health professional during this period, 2013 data are not yet available. Some infants have received weekly dispensings attributing to large volumes of items dispensed.